April 20, 2015 — I’ll never make it to space. I’ve come to terms with that. So it’s nice that space sometimes comes to earth. Even if it has to be a real jerk about it. 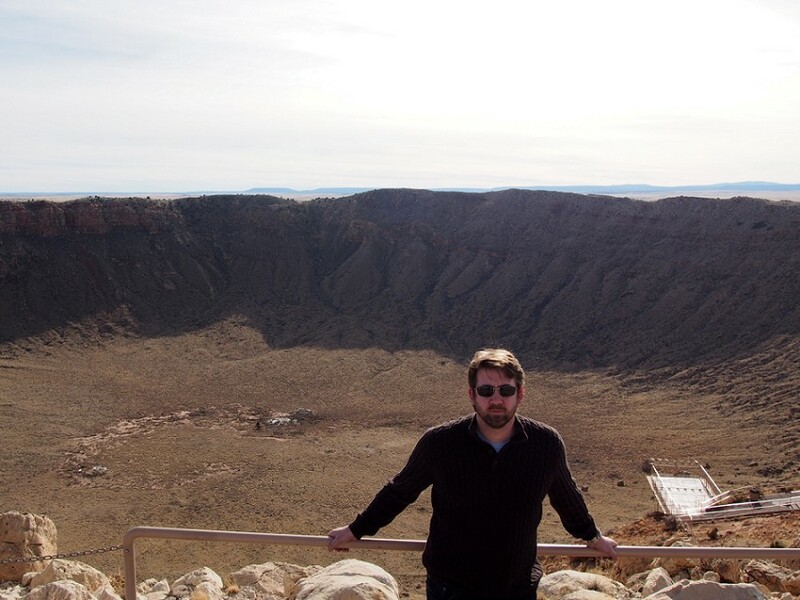 We were headed to the Arizona Meteor Crater in the center of the state, near Flagstaff. As we got closer, circular signs with streaking meteors advertised various aspects of the site. One said, “First-Proven Best-Preserved Impact Site on Earth.” Another proclaimed, “Speed Limit Motor Vehicles: 50 mph. 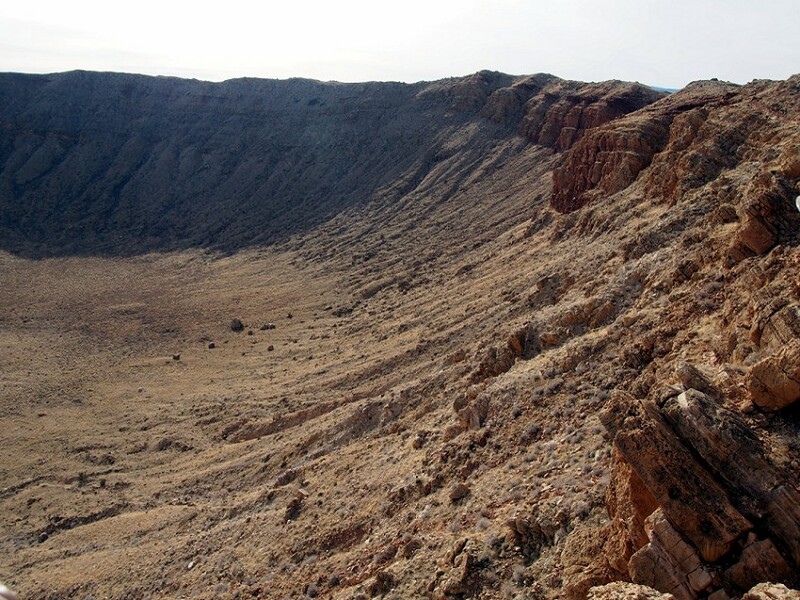 Meteors: 26,000 mph.” A third told us to tune our dial to a dedicated radio station to hear more about the crater. We did, and almost turned around, as a result. What was coming off the FM band sounded extraordinarily cheesy. 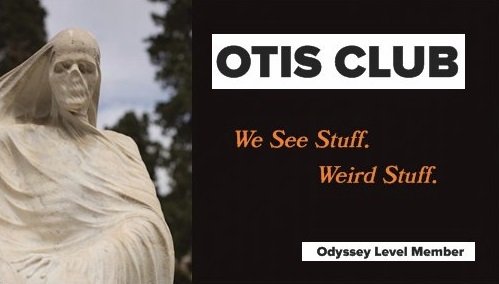 Like it was advertising a tourist trap instead of a cosmic wonder (and terror). I like a good tourist trap, but I was there to be awed. To see something I’d never seen before. To have my insignificance smashed in my face like a whip-cream pie. What I was hearing on the radio made me wonder if I was making a mistake. Earlier that day we had passed Bedrock City, the crumbling Route 66 attraction dedicated to The Flintstones, but we didn’t stop. No time to if we wanted to make it to the crater before it closed. The entrance facility, I mean (although the idea of a massive, ancient crater winking shut for the night makes me happy). But maybe we should’ve swapped the Arizona hole for having a gay old time with a modern Stone Age family. I turned the radio off. 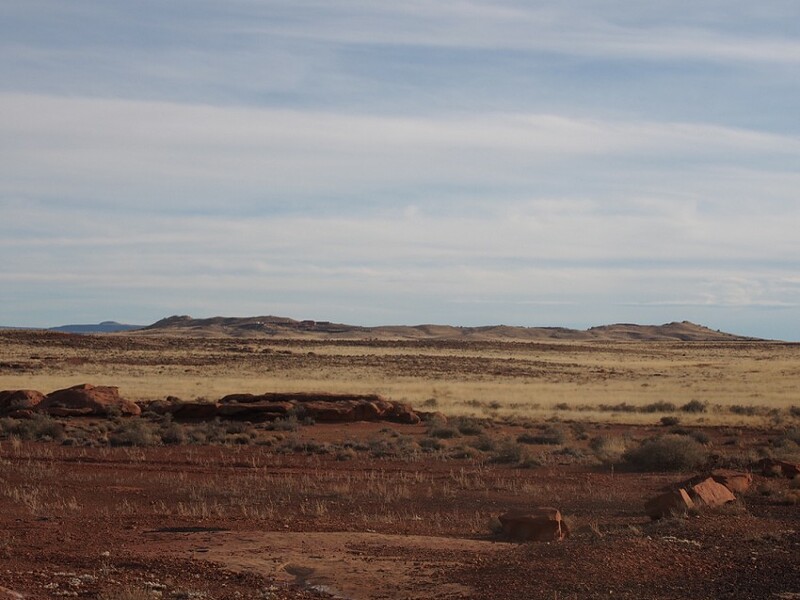 Ahead, we saw a ridge rising from the arid plain. Affixed to the edge of the ridge like a Borg implant was the entrance facility glinting in the desert sun. As we pulled into the parking lot, the facility towered over us. On the other side of it dropped the crater. 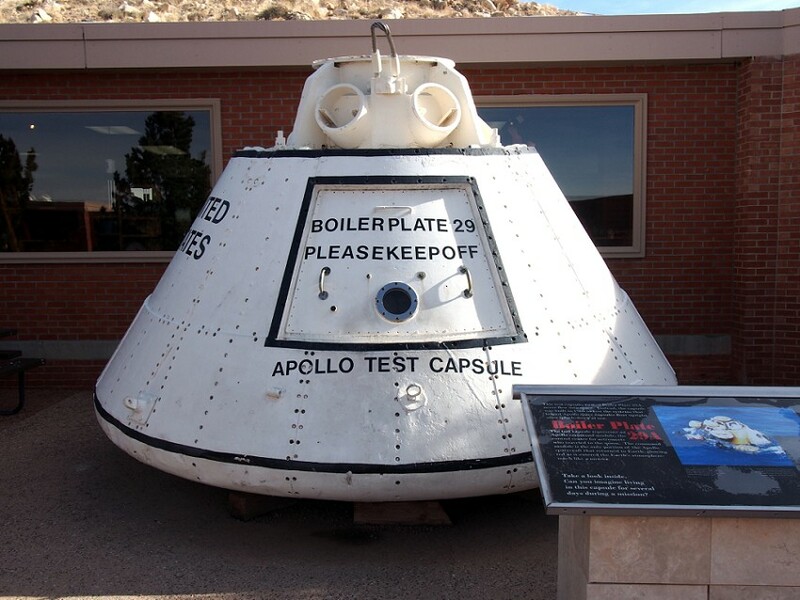 Outside the entrance was an actual Apollo test capsule and an American Astronaut Wall of Fame. I’ll tell you why in a second. Inside, we stepped into an elevator and ascended to an impressively large gift shop, but we quickly pulled away from all the crystal skulls and stone trilobites to walk up a flight of stairs and out a door. When we stepped out, all doubt about the place vaporized faster than the meteorite that made the hole we were gawping at. About 50,000 years ago, during the Pleistocene epoch, a nickel-iron meteorite about 150 feet across impacted the Earth there with a multi-megaton explosion. According to Wikipedia, its only witnesses were buffalo and giant ground sloths. What it left behind was a crater almost 4,000 feet in diameter and 570 feet deep, not counting the extra 150 feet of rim it raised above ground level, a rim that we were now teetering on. My eyes had as much trouble as my camera trying to take in the whole panorama of what we were seeing. 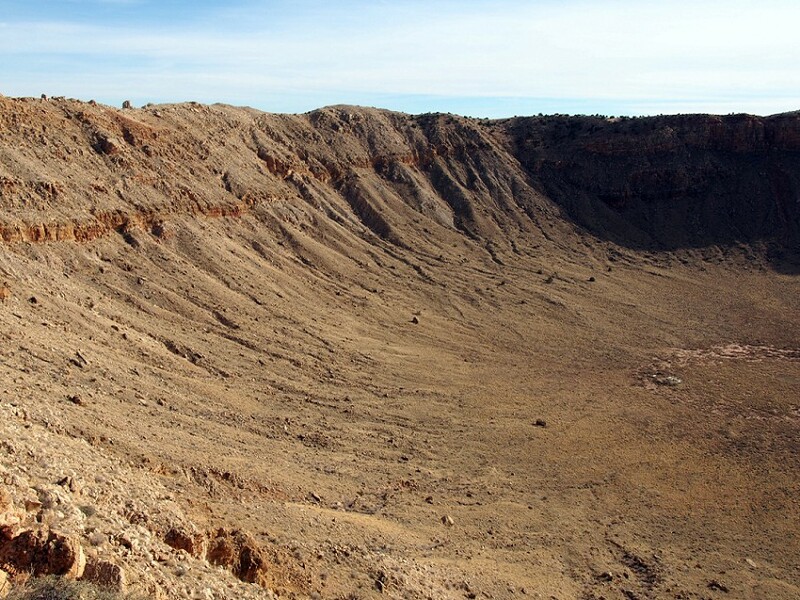 I threw the numbers up already, but the crater’s big. But like a nice big. Big enough to induce honest, primal awe, but not so big it’s impossible to comprehend, like that more famous hole to the northwest, the Grand Canyon. The inside surface of the crater was softened by a thin layer of yellowish-green scrub brush, and atop the rim were what looked like mere rocks but which, a sign informed me, were boulders the size of houses. That boulder in the upper right? The size of a house. We wended our way slowly down through three different observations decks at three different levels, dodging the tiny lizards that scampered across our path and stopping ever few steps to stare down into its depths, as we alternate between trying to scope the size of the crater and the vast distance the meteor must’ve flown to end up crossing the Earth’s orbit at the wrong moment. At each terrace was a row of free telescopes we used to zoom in on various features and artifacts. 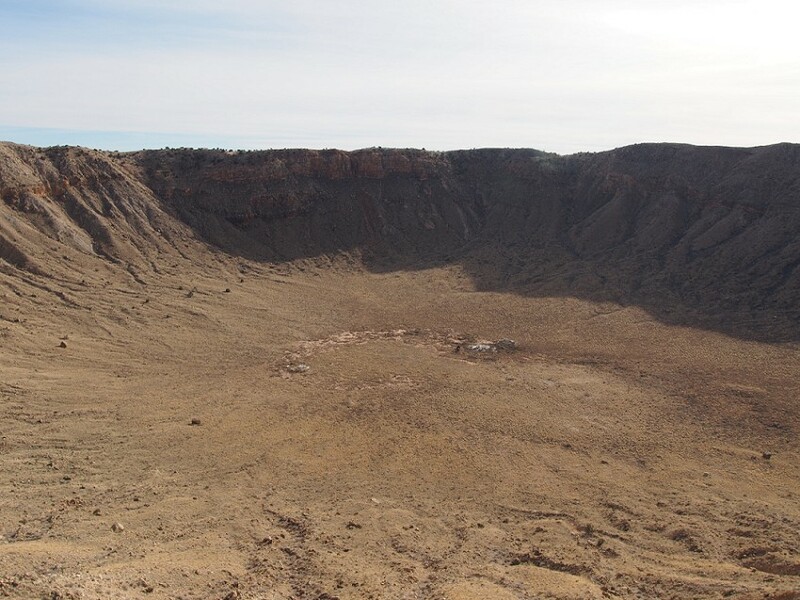 In the center of the crater, invisible to the naked eye, were a crude six-foot-tall cutout of an astronaut and a 5x5-foot flag, to help visitors better gauge the size of the crater. They were attached to fences set up around a couple of century-old abandoned mineshafts from back when they thought there might be something worth mining at its center. This was about 80 years before Creepshow, so they didn’t know not to do that. On the way out, we hit up the museum, which was also great. 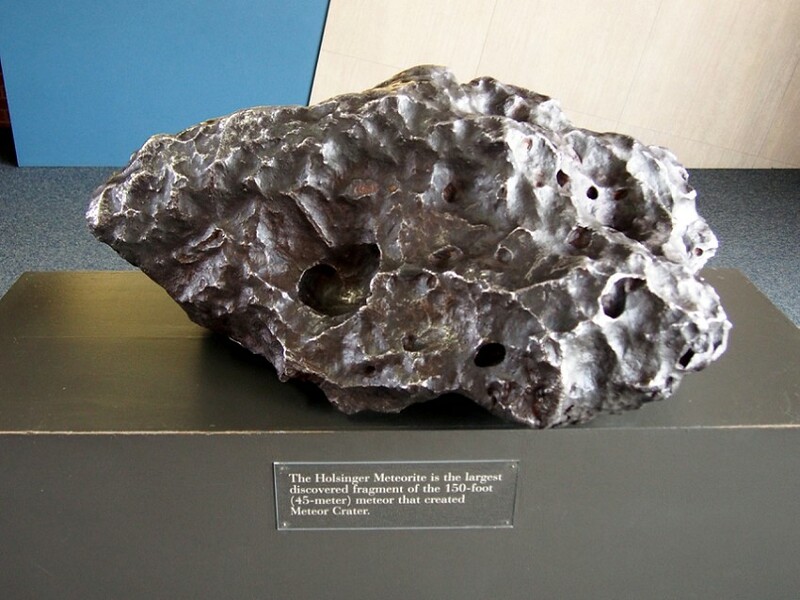 Even included the largest fragment of the meteor ever found, the Holsinger Meteorite. It was about the size of a piece of carry-on luggage. Not that I was measuring it for that. As we drove away, the rim receding in the rear-view, a pair of antelopes cross the road in front us. We’d made the right call. Next time, Fred Flintstone. Next time.